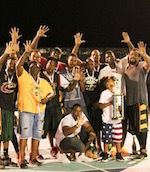 Shottaz defended their AABA title. They swept the title series versus Hoyas. Shottaz earned a 66:64 victory in the first game of the Finals. Jason Hodge (201-F, college: Oklah. Panhandle St.) stepped up with 18 points and 18 rebounds to pace the winners. Hoyas stayed in charge throughout the first half. They registered a 39:30 halftime lead. But Shottaz narrowed the gap at 3-point mark at the final break. Shottaz held their opponents to 10 points in the fourth quarter and snatched a tough win at the end. Colin Harrigan (183-G, college: Clinton CC, IA) contributed 16 points for the winners. Ian Connor (203-F, college: Mansfield, PA) answered with 15 points and 10 rebounds for Hoyas. Shottaz improved their performance in the second game. The defending champions built a 30:19 lead at the interval. Shottaz entered the fourth quarter up by 14 points 46:32 and never looked back en route to the victory. Rageim Burton chipped in 24 points for the winners. Javille Brooks (193-G, college: St.Vincent) and Jason Hodge added 14 points each for Shottaz. Daury Herbert replied with 19 points for Hoyas.